This is the ultimate chocolate chip cookie cup dessert recipe: thick Chocolate Chip Cookie Cups with Cookie Dough Frosting baked in a cupcake tin with rich, egg-free chocolate chip cookie dough mounded on top. Don’t waste any time – pour yourself a tall glass of milk now because these are quite possibly one of the richest desserts on my blog thus far. 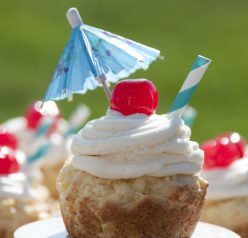 You all should make these for one of your Easter recipes or Memorial Day. If I could only have one dessert for the rest of my life it would either be ice cream or just a perfect chocolate chip cookie (these are things I think of as a food blogger who is obsessed with food). These Chocolate Chip Cookie Cups with Cookie Dough Frosting take chocolate chip cookies to a whole new level for me…as they will for you. 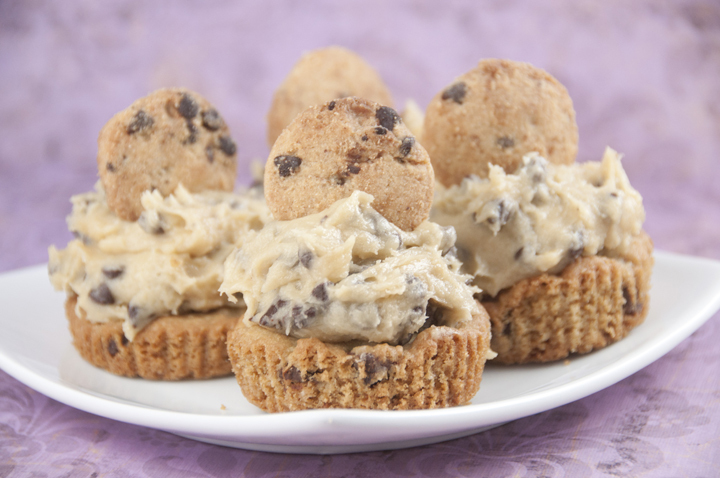 They are soft baked chocolate chip cookie cups with the wonderful taste of that tempting “raw” cookie dough that I can never seem to keep my fingers out of. I brought these Chocolate Chip Cookie Cups with Cookie Dough Frosting to a friend’s house who is obsessed with cookie dough…possibly even more than I am. They were devoured in about 8 seconds. You can pipe the cookie dough frosting onto these bad boys but this frosting is pretty thick and looks more like “cookie dough”. Therefore, you can just scoop it on with a cookie scoop or ice cream scoop. Either way, it will still have the same amazing taste. 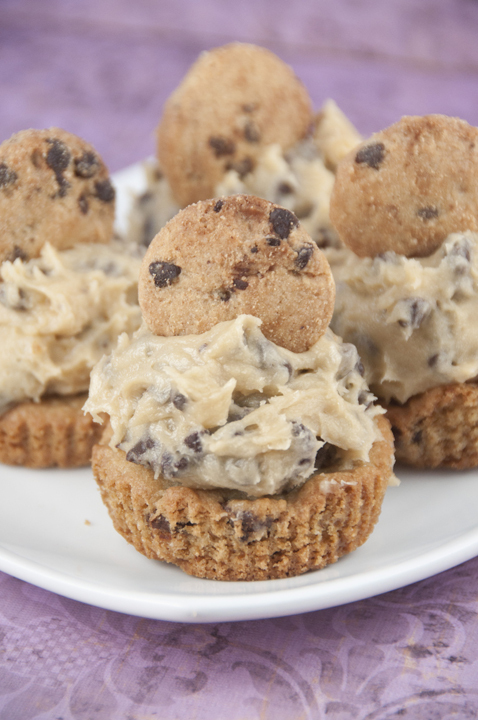 If you like these, you absolutely need to check out my Monster Cookie Dough cupcakes! 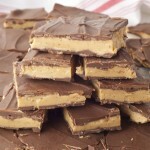 They are one of my most popular recipes on my blog ever since I posted them. Also be sure to try these Chocolate Chip Cookie Cheesecake Bars from my friend Trish. Enjoy! Chocolate Chip Cookie Cups with Cookie Dough Frosting: thick chocolate chip cookies baked in cupcake tin with egg-free chocolate chip cookie dough frosting. Preheat oven to 350F degrees. Line two 12 cup muffin/cupcake pans with liners. Set aside. Make the cookie cups: In a large bowl using a hand-held mixer or stand mixer with paddle attachment, cream the butter and sugars together on medium speed until fluffy and light in color. Mix in the room temperature egg and vanilla. Scrape down the sides as needed. In a separate bowl, combine flour, cornstarch, baking soda and salt. On low speed, gradually mix this dry mixture into the wet ingredients. Mix in the chocolate chips (the dough will be thick - this is OK). Press 1.5 Tablespoons of dough into each muffin liner. Bake for 11-12 minutes, removing from the oven when the edges begin to slightly brown and the centers still appear soft. Do not bake longer than 13 minutes - you want them to be a little soft. Allow cookie cups to cool completely before frosting! Make the frosting: With an electric or stand mixer using a paddle attachment, cream together the butter and brown sugar at medium speed. Add the vanilla and beat well. Stir in the flour and salt until doughy. Beat in the milk until mixture is fluffy. Gently fold in chocolate chips. Frost cooled cookie cups with the frosting. I used an ice cream scoop to mound it on top. Unfrosted cookie cups stay fresh covered at room temperature for 5 days. Frosted cookie cups must be stored in the refrigerator because of the frosting. Originally published on 5/20/2015. Republished with edits on 3/16/2018. YES! 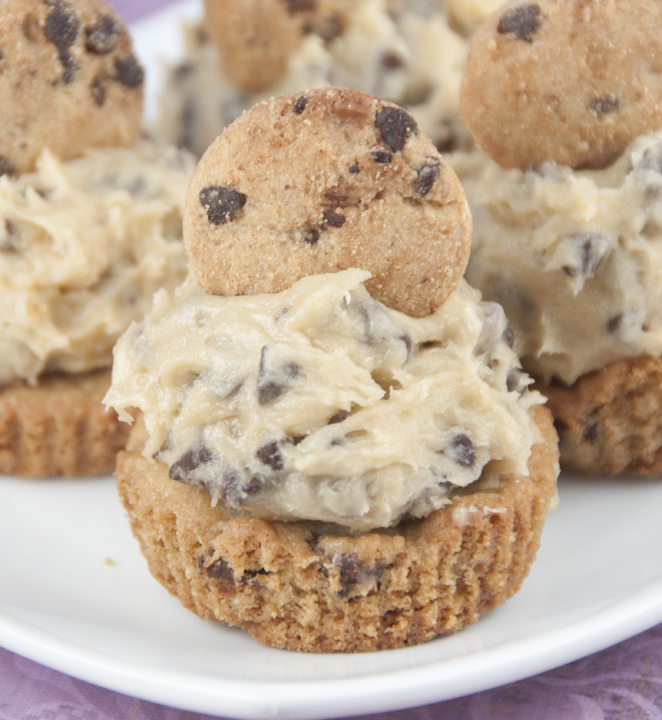 These are the cookie dough lover’s ultimate dessert! Oh my GAWsh. I seriously need these in my life. This takes my obsession for chocolate chip cookies up a whole lot of notches. Wow! These look over-the-top good! Really terrific recipe — you’ve outdone yourself. Thanks! There is no such thing as too much cookies/cookie dough! Oh my gosh – these look incredible! I adore chocolate chip cookies – and this takes it totally over the top! Oh my word, that frosting! YUM! Okay, so let me get this straight – You’ve made cookies and topped them with cookie dough? Could you please pinch me to make sure I’m not dreaming….or in heaven! Holy moly these look so decadent and awesome! I do love cookie dough!!! THESE ARE EVERYTHING. That is all. 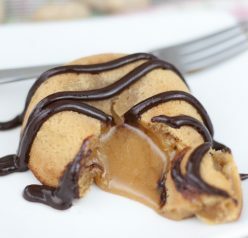 But, seriously, cookie dough and a cookie IN ONE? YES! in the cookie cup ingredients it says, ” 1 and cup semi sweet chocolate chips” does that mean more than a cup is to be used, or is the “and” a typo and only 1 cup of chips is to be used? This looks like the perfect comb between chocolate chip cookies and cookie dough. What a great treat! I saw these on your facebook and fell in love with them! Love that Cookie Dough Frosting! I bet those would go like hotcakes at a party! What a combination. Richest dessert? Sounds good to me! Love this! These SERIOUSLY look so good. I need to make them! Oh my goodness! These look absolutely amazing!